Even the Prime Minister Theresa May is saying it. Low interest rates are not lifting the economy in the right way. So time for government spending and tax cuts to take over? Or, as economists call it, active fiscal policy. She joins a chorus of academic economists and newspaper commentators. The story goes back to the 1930s when the Depression was rampant. This hit government tax revenues and the conventional wisdom was that government spending had to be cut to balance the budget. Enter the great economist Maynard Keynes. Keynes pointed out that the problem with the economy was a shortage of demand – not enough people buying things to pay for the people in jobs. Or to put it another way, there was excess saving. If people are saving, they are spending less than they earn. That means that there isn’t enough spending across the economy to pay everybody’s wages, so the economy sinks. Or it will sink if the savings are not spent on investment, which is another type of spending. Stuffing cash into mattresses is not investment. Neither is putting the money into a bank account unless the bank lends it to somebody who in their turn pays somebody to do something. In a depression people are unwilling to invest, and so saving tends to be higher than investment. And so the economy enters a doom-loop. Before the 1930s economies were marked by severe boom and bust cycles. Keynes pointed to a way through. If government increased its spending or cut taxes, they would put money in people’s pockets, which would be spent, neutralise the excess saving and bring the economy back to life again. Slowly governments followed his advice, most famously US President Franklin Roosevelt with his New Deal. The most spectacular success came in Hitler’s Germany, which spent freely on infrastructure (think of the autobahns) and armaments. Keynes pointed out that it did not matter what the spending was on provided it was spent at home, or at any rate it didn’t matter at first. As the economy approaches capacity wasteful government spending is a problem, but not before then. The rapid expansion of the US economy as it was placed onto a war footing in the 1940s proved Keynes right beyond doubt. Thus was born fiscal policy as an instrument of economic management, and economics as a discipline entered a golden age. The swings from boom to bust were notably reduced in the 1950s and 1960s. Then it came off the rails. In the 1970s things changed. The first shock was the breakdown of the Bretton Woods system of managed exchange rates – it could not handle the excess of US spending on the Vietnam war. This destabilised the international financial system. Then came the oil shock in 1973, as OPEC ramped up oil prices massively. The governments that tried to spend their way out of the subsequent recession merely created inflation and not jobs. The governments that applied stricter fiscal policy, West Germany and Japan in particular, suffered much lower inflation. Enter another economist: Milton Freidman. Freidman suggested that Keynes had it all wrong. The issue was not managing government spending and taxes, it was managing the money supply. The Depression was severe because the banking system collapsed, and people couldn’t borrow money. A lot of what Freidman said turned out to be nonsense, but what evolved was the neo-Keynesian consensus. This relegated fiscal policy to a relatively minor role. In the conventional wisdom of the time (often referred to nowadays as “neoliberalism”), government spending could easily get out of hand, destroy inventives and make economies less efficient. Instead the main responsibility for managing the business cycle came to something referred to as “monetary policy”, run by central banks. Monetary policy is a bit of misnomer, a hangover from Freidman’s emphasis on money supply. To this day people often explain monetary policy as if people paid for things in banknotes, which are printed at will by the central bank. In fact money has moved almost entirely to accounting systems of debtors and creditors, with banknotes relegated to a very minor role. The economic implications of a bank account are utterly different from those of a pile of banknotes. The idea of money supply is nearly meaningless. Instead of that, as regular commenter to my blog Peter Martin put it in a post to Lib Dem Voice, what we have is interest rate policy. Money supply in the economic models taught to students has become a completely theoretical concept that cannot actually be measured . If demand is falling in an economy, this is corrected by reducing interest rates, which should encourage people to spend more. If things look like getting out of hand, then interest rates are raised. Through the 1990s and early 2000s this system seemed to be working, but it came under increasing criticism. Central banks used inflation targets to judge whether the level of demand was too high or too low. But this measure excluded asset prices, which were directly influenced by interest rates. Asset bubbles were allowed to develop. Then they popped in 2007 to 2009, in the financial crash and the big recession that ensued, which interest rate policy proved unable to correct. Fiscal policy made a return. But it was tentative. As soon as the worst of the recession was over, governments cut back (widely referred to as “austerity”). Critics argued that this was stalling any recovery. Then the victims of low interest rates, those saving for pensions in particular, started to get agitated. This is most evident in Germany – but Mrs May was voicing concerns amongst her constituents in the UK. So can fiscal policy help lift economic growth, in place of low interest rates? There is a strong case for this, but caution is warranted. Most economic commentators hedge their bets by recommending that extra spending is on infrastructure projects, that will yield economic returns in their own right. This hints at the first of three reasons for caution. What if the reasons for slow growth are structural and not to do with low aggregate demand? Are we making the same mistake as the mid 1970s, when economists saw high unemployment and low growth and assumed that this meant lots of spare capacity? In fact economies then had suffered a major dislocation from the oil shock, and were slow to adapt because of excessively unionised and corporatist economic management. That was then, but there are plenty of suggestions as to what the capacity restraints might be now, starting with demographics. Investing in infrastructure should help overcome these constraints, killing two birds with one stone. The second reason for caution is that economies have internationalised. A lot of the benefit of fiscal stimulus can leak abroad, especially if other countries have a deficiency of demand too. Fiscal stimulus might simply drag in imports from countries eager for export-led growth. Globally coordinated fiscal policy works much better. This was achieved in 2009, but consensus has broken down since. The risk of stimulating other people’s economies can be reduced if the stimulus programme is carefully designed. But it can be quite hard to tell where best to direct spending or tax cuts. And the third reason for caution is the difficulty in understanding when to turn the tap off and tighten policy. Politicians are prone to fiddling the figures to put the evil day off. British Chancellor Gordon Brown was notorious for this in the mid-2000s, contributing, in my view anyway, to the severity of the financial crash in 2007-09. Anti-austerity has become a political totem on the left – and yet there must come a point in any business cycle when austerity is required. This is also a problem with using infrastructure investment as the prime instrument of fiscal policy – it is not so easy to manage according to the business cycle. Lead times can be long and if an investment project is worth doing, it is probably worth doing at all points in the cycle. And a final point. looser fiscal policy is unlikely to help savers with raising interest rates. Interest rate policy and fiscal policy should not be working against each other. To raise interest rates we need to see a healthier British and world economy. That looks some way off. A dark mood is overtaking those who contemplate the world economy. Today Britain’s Chancellor George Osborne will join a growing chorus of worry. Weak outlook in emerging economies is undermining efforts to revive developed ones like Britain’s. So far the prognosis is stagnation rather than economic disaster – a mood caught by the FT’s Martin Wolf, who tells us not to be too pessimistic. But these are dark clouds and policymakers would do well to prepare for rough waters. Mr Wolf bases his relative optimism on the fact that world economy has being growing steadily for some two centuries, and with particular steadiness since 1945. Until the potential for further growth is exhausted, which he doesn’t think is anywhere near the case, that growth will carry on. But macroeconomics has changed profoundly in the last ten to twenty years. And even orthodox economists are starting to appreciate this. The leading piece of evidence is that in the developed world central bank interest rates are stuck at very low levels, even though the recession of 2008-2009 was over five years a go, and there has been steady recovery since. And inflation, as it relates to pay and consumer prices, remains low. What had once been seen as a special case and compounded by policy mistakes, Japan after 1989, has become general. The Economist’s Free Exchange column has run a couple of articles on this. Orthodox economists had simply assumed that the way out of economic doldrums was through conventional short-term policies, such as loose monetary or fiscal policy. Japan’s problem, a whole queue of people, such as Paul Krugman, said, was simply a matter of a “liquidity trap” – when interest rates become too low to reduce. By the time I was studying Economics at UCL in 2005-2008, this was literally in the textbooks. Mr Krugman suggested that the solution was to raise inflation expectations in what seemed to me, even then, as a case macroeconomics gone mad. But even Mr Krugman now thinks something deeper is afoot. Larry Summers was the first orthodox economist to raise the alarm, and he gave the problem a name: “Secular Stagnation” – or rather he resurrected a theory of that name that had long been treated as a theoretical curiosity. The world economy is profoundly out of balance. This is because the amount people want to save is more than what people want to invest, causing aggregate demand to drain out of the system. This is an idea that Maynard Keynes made famous in the 1930s – but he assumed that such an imbalance was temporary, and specifically a feature of recessions. But what happens if the imbalance continues right through the cycle? We find that attempts to stimulate growth through monetary or fiscal policy run out of steam, and simply lead to asset price bubbles, as surplus money chases the same assets round in circles. Inequality – the popular explanation on the left, including Mr Krugman and Robert Reich. A greater share of income is going to a very wealthy minority, or is stuck in corporate balance sheets. This is saved rather than spent, contributing to a surplus of savings. Trade surpluses. China, Germany and (until recently) some oil states have been running up structural trade surpluses, which again creates surplus savings globally. This makes people like Mr Wolf hot under the collar. Excessive levels of private debt. This theory is favoured by heterodox economists like Steve Keen. Private borrowing as a ratio to income has been steadily rising and is at record levels. Bank balance sheets are clogged so they can’t lend to fund new investment. Meanwhile private individuals are spending too much on debt repayments and interest to spend on consumption. Modern businesses require less capital, reducing demand for investment. Microsoft and Google required no bank loans and little new capital to develop their businesses, unlike the industrial giants of old. This may be a function of technology, or simply “Baumol’s disease” – the fact that productivity improvements are tilted towards particular industries, whose weight diminishes as they become more efficient. Mr Summers seems to incline towards this explanation, while not dismissing the others. Demographics. The proportion of workers compared to retired people is diminishing in the developed world and some other countries, like China. This squeezes the supply side of the economy and hence investment. It also undermines any benefits of productivity growth, the traditional engine of economic advance. This was clearly a factor in Japan, which led the trend. Is this just a developed world problem? Surely, with so many countries still poor, there are opportunities to raise productivity, and hence global growth in poorer countries? The growth of developing East Asian economies, starting with Japan, and latterly dominated by China, has been an important component of recent world growth. And yet there are few signs than other developing economies can move much beyond exporting natural resources, while China is picking up some distinctly developed world issues. India may be an exception, but the jury is out there. So what is the solution? That, of course depends on how important each of the above factors is. But there is a big question behind this. Most economists assume that economic growth is a natural state of being, and simply want to remove obstacles to future growth, by raising the level of investment, for example. Others feel that slowing growth is part of a bigger development cycle and something we had better get used to. I incline to this second view. Private debt. You don’t have to subscribe to Mr Keen’s ideas to understand that growing levels of debt are part of the problem, whether symptom or cause. Big business. These are accumulating too much power, and skewing the distribution of resources. Asset values. In much of the world, excessive asset values, especially land values, are a sign of economic dysfunction. This is especially the case in Britain. This is not a simple matter of supply and demand – excessive debt is part of the problem. Migration. This is one of the ways that economic pressures can be relieved. But as we know all too well, a host of problems follow in its wake. Government debt. In the short to medium term, for most developed economies, high levels of government debt will be much easier to sustain than conventional wisdom suggests. And yet in the long term this could lead to economic breakdown, as is happening in some South American economies. The left have a strong theoretical case in opposing austerity, but undermine it by opposing almost any reform designed to improve economic efficiency and promote sustainability. Free trade. Free trade is an important part of the current global system, and it won’t help to reverse it. But the rapid globalisation of supply chains which was such a feature of the last two decades, is going into reverse, as the East Asian economies mature. This is one reason why growth is slowing – but it is the reversal on a phenomenon that was always going to be temporary. Further liberalisation of trade poses challenging questions, as TTIP and TPP are demonstrating, and may simply benefit big business. Inflation. It used to be thought that inflation was a matter of managing expectations by the central bank, and of paramount importance. This is still true in some less developed economies. But in those exposed to global trade this is an entirely unhelpful way of looking at things. More powerful forces are keeping prices stable and inflation is less and less an issue that central banks need to act on. Interest rates. These are set to stay low for a long time yet. The betting is that the recent rise in the US will be just one of a long line of failed jail-breaks, started by the Bank of Japan in the 1990s. The state of the world economy is worrying economists. GDP growth is lacklustre in the developed world, which in turn poses problems for the developing world. That’s bad enough, but the economist’s nightmare of deflation – prices dropping rather than rising – now beckons around the world. And yet the prescriptions of most economists are shaped by a way of looking at the economy that belongs to the past. A paradigm shift is needed. Debt is at the heart of it, not GDP growth. For a clear, conventional analysis of the issue read this week’s Economist. Here’s a brief summary. The developed world economies are suffering from deficient demand. In other words, the economies could easily churn out more goods and services, using existing capital and labour, but don’t because people aren’t asking for the stuff or can’t pay for it. Another way of putting this is that the amount of investment (people spending money on building capital rather than the immediate consumption of goods and services) is less than the amount of saving (the amount by which people’s income exceeds the goods and services they consume). This leads to low growth rates. 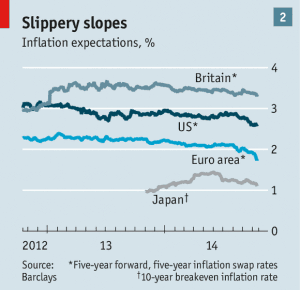 Now inflation is falling and deflation threatens. Deflation is bad, at least when low demand is its cause, because it makes debts more difficult to repay, and this gunges up the financial system, which makes matters worse. The conventional answer to this problem, which also goes under the name of “secular stagnation”, is to reduce the prevailing rate of interest. This will encourage people to invest more since the returns to investment, compared to simply sitting on piles of money, would then be higher. But deflation, or low inflation, makes this impossible, because it raises the floor – the lowest real (after inflation) interest rate it is possible to charge. Answer: you raise the level of inflation. The method of doing this is to increase the money supply, since inflation is a monetary phenomenon. All sorts of ingenious ways are then dreamt up of how to do this. But this is all the product of a conventional way of thinking based on aggregate economic statistics, rather than what is really happening in developed societies. Stagnation, in and of itself, is not necessarily a bad thing in the developed world. Surely the current level of consumption of goods and services is sufficient, in aggregate, to secure perfectly decent wellbeing for everybody – and economic growth is not the most efficient way to securing improvement to that wellbeing. And as we judge the potentially catastrophic impact of man’s demands on the planet it is clear that a system based on ever increasing consumption cannot end well. We need to make better choices about what we consume, and distribute the consumption more evenly. But economists seem to worry about the speed of the train, rather than where it is going, or even whether it has arrived at where the passengers want it to go. Inflation in the modern, developed world does not work in the way the economic textbooks suggest. In particular the rate at which monetary wages rise has become detached from the rate of increase of consumer prices. Macro-economic policies, like monetary policy, aimed at increasing inflation may feed through to consumer prices without doing much for wages. This completely undermines the supposed benefits of a little bit of inflation. Things are no better in capital markets. Reducing interest rates seems to have little effect on levels of genuine, productive investment. Such investment is driven much more by zeitgeist than interest rates. Excess money either chases a relatively fixed pool of existing assets (land and buildings and shares), or it simply piles up in bank accounts. This makes conventional monetary policy very hard. Distribution of wealth and income matters more than aggregates. This is the complete opposite of late-20th century conventional economic wisdom. The problem is that wealthy people have too much income to meat their needs, and that there are inadequate channels to invest the surplus productively (as opposed to bidding up property values, etc.). To try and balance out the deadening impact of this, the answer has been to get poorer people to consume more by piling up debt. That would be fine if those poorer people turned into rich people later in their lives – but that is not what is happening. This is unsustainable – and yet most conventional economic advice boils down to cranking this system around one more time. Modern businesses require much less capital investment than previously. The modern business giants of Microsoft, Apple and Google never needed much debt and did not need much capital to get going. This is simply the way that technology has evolved. There remains demand for public infrastructure: railways, hospitals, power stations and so on, but the risks and returns, and their often monopolistic nature, makes this a difficult area for private businesses, as opposed to governments, to lead. This is one aspect of what economists refer to as “Baumol’s disease” – the paradox that the more productive the efficient areas of an economy become, the more the lower-productivity areas predominate in the economy as a whole. Globalisation has changed economic dynamics profoundly. Amongst other things it has weakened the bargaining power of workers – one reason that prices and wages are becoming more detached from each other. Also, less talked about and perhaps controversially, I believe that globalised finance means that developed world governments have less control over their currencies and monetary policies. This is one reason why it is more difficult to use monetary policy to manage inflation. It is also the reason that Europe’s currency union makes much more sense than conventional economists allow – but I digress. Technology is changing the way the jobs market is working. Many middle-range jobs, in both manufacturing and services, are disappearing. This week Britain’s Lloyds Bank announced the loss of 9,000 such jobs in its branches and back office. This, and not the flow of immigrant labour, is the reason why the labour market has turned against so many. And finally, I think that many consumers appreciate that additional consumption, and the income to support it, are not the answer to improved wellbeing. It is better to stop earning and pursue low-cost leisure activities. I notice this most in middle-aged middle-class types like me – who are retiring early. It is perfectly rational. And yet economists can’t seem to understand why reduced consumption and income might be a rational choice for an individual. There is a tendency to tell us to go out and spend more for the good of the economy. This is a perfectly liberal and rational downward pressure on national income – which surely should be encouraged for the sake of the planet. Some of the consequences of these trends are straightforward. Redistribution of income and wealth are now at the heart of political and economic policy, rather something that can be ignored. A much greater proportion of economic investment must be government-led, which imposes a massive challenge for political management. 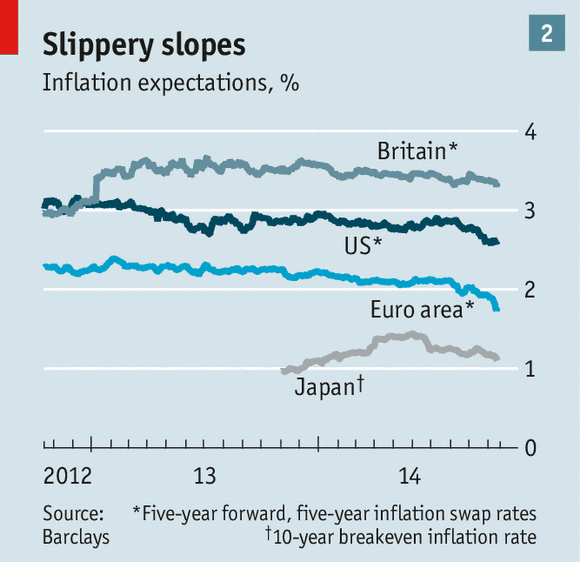 Governments and central banks trying to tweak the inflation rate by a few percentage points is a fool’s errand. Also trying to revive the economy by getting the banks to lend more money to poorer people is unsustainable, even if the lending is collateralised on residential property. The appeal by many economists, such as the FT’s Martin Wolf, that developed country governments should borrow more to invest in infrastructure makes a lot of sense. Using monetary policy to help finance such investment makes sense too. Making sure this investment is directed sensibly is a bigger problem than most allow, though. And the conventional economists are right to worry. A world of stagnant growth and low to negative inflation creates major problems. In particular many debts, in both private and public sector, will not be repayable. At some point there will be default, since the other options, inflation and growth, are off the table. Or to put it another way, much of the financial wealth that many people currently think is quite secure is anything but, in the longer term. This may a problem for many pension and insurance schemes, as well as wealthy individuals and corporations. The consequences of this are quite profound. Our society must break its addiction to debt. The banks and the financial sector must shrink. “Leverage” should be a rude word in finance. If low growth is the result, or if a new financial crisis is hastened, then so be it. Let us learn to manage the consequences better. Borrowing to support genuine productive investment (not excluding the building of new houses where they are needed) is to be encouraged, including government borrowing to finance public infrastructure. But other borrowing must be discouraged. Taxation should increased, especially on the wealthy. If that causes a loss of productivity, then so be it – this should be compensated by more efficient financial flows from rich to poor. Political reform must run in parallel to ensure that public investment is conducted efficiently, rather than just disappearing into the pockets of the well-connected. This is a daunting programme. Stagnating national income and deflation are not inevitable consequences – since these policies do address some of the causes of deficient demand. But we must not think that these statistics are the lodestars of public policy. We need a much more nuanced appreciation of the wellbeing of our planet and the people that live on its surface, and put it at the heart of economics. In his recent book on economics (reviewed by me here), George Cooper presented the discipline as being an irretrievably fracture, in need of a radical step change. There is an alternative view. This is that in fact the profession is split between two orthodoxies, with a diverse bunch of heterodox economists on the fringe, unable to get serious traction. The two orthodoxies are often given the names “salt-water” and “fresh-water”, because the former are popular in U.S. universities on the east and west coasts, and the latter with those in the Midwest – especially Chicago. This is worth picking apart. Followers of each of the orthodoxies assume that criticism of economics is directed mainly at the other orthodoxy, and not at them. The heterodox say that the whole lot is in a mess. The fresh-water school do seem be in eclipse. This school, often termed “neoliberals” outside the US, believe that free markets are the fairest way of allocating economic resources, and that government interference almost always makes things worse. Many assume that they were cheerleaders for the rampant excesses of the financial sector before the crash, and hence have had their come-uppance. This criticism is wide of the mark, however. The banking boom arose at least as much from lop-sided government intervention as it did from “light-touch” deregulation. Fresh-water economists can plausibly blame the crisis on government intervention, not its absence – and in particular the crazy desire of politicians to boost property lending to all and sundry. In fact there are other fatal problems for fresh water economists. First is that they opposed serious government intervention once the bubble blew. This was self-evident nonsense, ignored to a greater or lesser degree by practically everybody – except where government borrowing presented a practical problems. There have been loud arguments over austerity that have been so loud, but these have been on degree of intervention (big or massive?) and on completely different territory to that advocated by non-interventionists. A second problem is posed by what is usually called “inequality” – whereby it appears that the benefits of growth in developed economies go predominantly to the rich – and that most people in the US have seen little or no benefit from decades of economic growth. It is a central facet of fresh-water thinking that distribution of wealth and income is not an important concern for economists and policymakers. They have almost nothing to say here. And people are starting to notice that in countries with minimal governments (Somalia, say), the economy tends to be in pretty bad shape. Of course fresh-water economists remain well funded, as their views provide convenient support to many vested interests, and they are not about to go extinct. But you don’t hear very much from them these days. Unlike the salt-water types. These are popularly referred to as “Keynesians”, and are now very well entrenched right across the political establishment. Their most visible cheerleader is Nobel Laureate and columnist Paul Krugman. They were as wrong-footed by the crisis as any of them, but quickly found the groove again. They provided the intellectual heft required to support government intervention after the crisis, though they usually complain that this intervention was inadequate. Salt-water types do not consider that the crisis showed that their thinking was seriously flawed. Consider this piece a few weeks ago by Mr Krugman. He simply suggests that salt-water economists were a bit misinformed – because they underestimated the practice of shadow banking. Shadow banking, in this context, refers to the practice of banks hiding their dodgier lending by creating off-balance sheet entities to take them. To be fair on Mr Krugman, in the run up to crisis his writing was hardly cheerleading for the supposed economic miracle – though that seemed to derive from his hatred of the then Republican establishment, and their attachment to fresh-water thinking. I can understand some of Mr Krugman’s frustration with the so-called heterodox economists. They tend to be pretty unconstructive – picking at the orthodox modelling assumptions (incidentally, largely shared across both orthodoxies), without suggesting much that could replace them in a useful way, to give the discipline a better predictive power. The beauty of the salt-water orthodoxy is that it finds it easy to tack on new ideas and integrate them – they have done this quite spectacularly with many of Milton Friedman’s ideas (on money, inflation and unemployment), even though he is one of the spiritual fathers of fresh-water thinking. They are now trying to do so with ideas on inequality, an issue that they acknowledge. Thomas Piketty, the French economist who is making a splash on inequality, looks more like somebody extending the salt-water orthodoxy, rather than challenging it. For me this is much too complacent. Regular followers of this blog will not be surprised to read that Exhibit A for the prosecution is thinking on monetary policy. Salt-water economists inhabit a world where the ideas of money supply, demand, interest rates and inflation interact in a relatively predictably way, to form an important way of regulating economic growth. Thus there is talk of raising inflation a bit, so that negative real interest rates can be implemented, which in turn will boost demand and get the economy growing. It is not that I think this line of reasoning is entirely mistaken, it is that it is an oversimplification that is more likely to lead to policy mistakes than insights. Take Japan. This country is probably further down the path of accepting salt-water economics than any other. It has drastically loosened monetary policy (through a process of quantitative easing) with the aim of raising inflation, which in turn will help the process of managing interest rates and boosting sagging demand. But there is a snag: while prices are rising to a degree, wages are not keeping pace. Employers will consider giving employees a temporary bonus, but not raising basic pay. Without raising pay, all the nice things that are supposed to arise from inflation – like making debt easier to bear – will not happen. Economists simply assume that if inflation gets going in consumer prices, wages are bound to follow. But this does not seem to be true of a modern, globally integrated developed economy. There are plenty of other pitfalls in Japan’s strategy too. The people at the heart of the salt-water school, like Mr Krugman, are a clever bunch. Heterodox economists do not seem to be unsettling their intellectual grip. Perhaps they are right that the orthodoxy must evolve rather than make a step-change. But if so it surely needs to evolve a lot faster. A few months ago David Cameron, the Prime Minister, defending the government’s austerity policy said that “Money doesn’t grow on trees!”, a well used expression when discussing household budgets. The Financial Times economics columnist Martin Wolf responded that money did indeed grow on trees, and the money tree went was the Bank of England. Can Mr Wolf be right? Mr Wolf was referring to the Bank of England’s policy of buying government bonds, known as Quantitative Easing or QE. One arm of the government, the Treasury issues bonds to pay for government spending; another, the Bank of England, buys them by simply adding to its reserves – creating money. Actually, the Bank doesn’t buy the exact same bonds, it buys others that had been issued earlier – but it amounts to nearly the same thing. The extra money ends up in the accounts of major investors such as insurance companies or pension funds, at home and abroad. Government spending has been financed by the creation of money. Hence money seems to grow on trees. This type of financing is associated in the public imagination with disaster – such as the hyperinflation in Germany and Austria after the First World War, or more recently in Zimbabwe. In conventional economic theory an increase in money supply, if not matched by expansion of the economy, leads to inflation. But there is no increase in inflation in either Britian or the USA, which are both practising QE, and in Japan, where increasing inflation is actually a policy objective of QE, the increase in inflation is anaemic. So what is going on? There are three problems with the conventional economic theory of money. First is that only trivial amounts of money are represented by notes and coins, whose circulation is controlled by the government. Instead we use bank accounts provided by commercial banks. Economists have tried to understand this type of money in equivalent terms to notes and coins. People bank money and the banks then lend it; the banks do not create money, though the central bank may. But further reflection reveals that this is not the way it works, as the Bank of England has recently admitted. It is the other way round: banks create money by lending it to people. With this more realistic idea of what money is, we can see that far from the money supply expanding with QE, it is shrinking as banks reduce their balance sheets after the boom years when they created money freely. You could then argue that QE is simply offsetting the shrinkage of credit from the banks, balancing the whole thing out. All will be well until the banks turn the corner and start creating money again. But there is a the second problem. The overall supply of money, as far as it can be measured, does not strongly correlate with either the size of the economy or inflation, as monetary theory predicts. That’s because money doesn’t flow round the system at a constant speed. If you print banknotes, and people simply stuff the new notes under the their mattresses, the real economy doesn’t change. The electronic equivalent is people holding bank deposits which they don’t spend. That’s been happening a lot. Standard monetary theory, such as that put forward by people like Milton Freidman, is based on the idea that money circulates at a reasonably constant speed. But in fact people don’t behave that way. But even if they did, there’s the third problem. Excess monetary expenditure does not necessarily lead to inflation; in fact in a modern developed economy it rarely seems to. Instead of people raising consumption which pushes up consumer prices and then pay, people spend it on assets or imported goods. Asset prices don’t seem to behave in a rational way, being subject to a price bubbles. In the modern globalised economy it is easy to import goods to satisfy any increase in consumer demand. And in any case the link between consumer prices and levels of pay has been broken. The wage-price spiral, at the heart of the way economists view the world, does not seem to happen in developed, globally integrated economies. Incidentally this is the problem that the recent aggressive monetary expansion in Japan (“Abenomics”) has bumped into; prices are edging up but companies remain reluctant to let wages follow suit, so that inflation simply makes people poorer. The concept of central banks targeting inflation as their main objective, the big idea of the 1990s, has simply led to complacency. So the theory of monetary economics is in ruins. That does not stop usually quite economically sane publications. like The Economist, discussing whether central banks should adjust their inflation targets from 2% to 3%, or use nominal GDP as their reference point instead of inflation. This is rearranging the deckchairs on the Titanic (apologies for the over-used metaphor). Fortunately central bank professionals are highly pragmatic and they don’t seem to be letting the vacuum in economic theory lead them into being too dangerous, with the possible exception of Japan. And the upshot is that in many developed economies, including the British one, governments can get away with the monetary financing of government spending, without much in the way of immediate adverse consequences. Money really does grow on trees! How on earth to understand this – and any not so benign consequences? Well you have to recognise that money is simply a means to an end: a social construct to enable economic activity and regulate societal relationships. It often helps when thinking about an economy to take the money away and see what is going on in what economists call the real economy. Let’s look at the real economic flows, which are at the heart of Mr Wolf’s analysis. The government is consuming more resources than it is receiving from taxation. This deficit must be supported from outside (you can’t print money in the real economy), and in general terms this is from two places: the private sector and outside the economy. The private sector, as a whole, is consuming less resources than it is producing and this surplus, in various direct and indirect ways is helping to support the government deficit. This is partly because people are working off their debts, but also because private businesses are hanging on to profits. Also the economy (in Britain and the USA in particular) as a whole is in deficit with the outside world: importing more than it exports. The government can safely run, or even increase, its deficit because it is balanced by surpluses by the private sector and the outside world. But this is not sustainable in the long term, because persistent deficits lead to excessive debts, and the monetary economy breaks back into the real one. If the government has cleverly got out of financing its deficit with debt, it is simply passing on the affordability problem to somebody else. The assets being accumulated by the private sector and foreigners are not worth as much as they think. The government has avoided the risk of a solvency crisis by increasing the risk of a currency crisis or an asset price collapse. This may be localised, or it may be part of a gathering global financial crisis. But if by running a deficit the government is staving off a wider economic disaster, or even bringing the country back to the path of economic growth, it is opting for a lesser evil. Mr Wolf argues for continued government deficits, financed by QE if necessary, on just these grounds. Austerity will simply precipitate the economic crisis rather than buying time to fend it off. He has a strong belief in a “trend rate” of economic growth of about 2% per annum which can be readily unlocked and get us out of jail. That’s where I disagree. That trend rate may sound a small number, but it is in fact a very large one for an economy that is fully developed (China can grow faster because it is catching up). A special set of circumstances combined in the period 1945 to about 1990 or 2000 to make it seem normal – but we are in a slow growth world now. So keeping government deficits going using QE to bypass the bond markets caries risks. The main priority for governments is to reduce their countries’ vulnerability to future crises and improve their resilience. That means rebalancing. Between public expenditure and tax; between rich and poor; between imports and exports; between financial engineering and productive investment; between young and old; between environmental degradation and restoration. Government deficits may or may not play a role in this rebalancing process. For what it is worth I think the British government has it more or less right in terms of its overall austerity policies. QE may or may not be helping. But any money plucked from trees will, to mix metaphors, go off if it isn’t spent wisely. Posted on April 10, 2014 Author MatthewCategories Economics & Finance, Politics UKTags economics, Martin Wolf, monetary policy2 Comments on Does money really grow on trees?